Fight Ontario government plan that will allow every small game license holder to kill up to 1500 cormorants a month! A short while ago the Ontario government announced, through an Environmental Bill of Rights website posting, their plan to designate cormorants as a “game” species and to allow anyone with an outdoors card and a small game license to kill up to 50 cormorants a day (you read that right, up to 50 a day, each and every day) for approximately nine months of the year with no limit on possession. That kind of rule hasn’t been seen since the days when passenger pigeons were wiped out 100 years ago. And for the first time ever since game laws came into being, it will be legal to just let the carcasses rot. This isn’t even sustainable consumptive use, it’s just a slaughter that will drastically reduce or even wipe out viable cormorant populations in the province. The government says it’s just responding to concerns heard from fishermen about depleted fish stocks and environmental damage, and complaints about too many cormorants. But those concerns are largely anecdotes, unsubstantiated claims (which have been debunked long ago) and complaints from a small, radical segment of the fishing community. No scientific studies or real evidence. If this change to the law proceeds it means that tiny numbers of radical fishermen will have the capacity to legally eradicate entire cormorant colonies. Small groups could be obliterated in the proverbial blink of an eye – perhaps just an hour or two. Larger colonies could be destroyed in a matter of just days or, at most, weeks. In fact, there’s a good chance that every viable breeding colony of double-crested cormorants in the province could be critically damaged or wiped out. 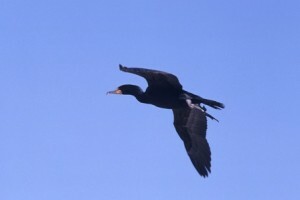 Cormorants are a native bird species and serve a natural, beneficial, ecological function. They are not overabundant and, because they are largely concentrated in just a few areas, are extremely vulnerable. The number of cormorants, who have returned to Ontario after nearly being wiped out on two previous occasions, are modest, have now stabilized and, in some areas, are dropping. The government’s ill-conceived plan takes Ontario back to the 18th and 19th century when many kinds of wildlife were persecuted and earmarked for extermination. 1. Comment on the EBR posting. There’s a 45 day comment period which is up on January 3rd (it’s not a coincidence that it’s taking place through the holidays – they hope people are too distracted to respond), so please go to EBR posting and provide your input. It’s critically important that the posting receive as many comments as possible. You can say as much or as little as you want (even a single sentence will be helpful). Please go to your computer or use your Smartphone and do this today! 2. Write to the Premier. Let Premier Doug Ford know what you think of his government’s plan to allow virtually uncontrolled killing of cormorants in Ontario. You can contact the Premier through his website by CLICKING HERE. For more information about cormorants CLICK HERE and watch our video Cormorants in the Great Lakes Basin, Dispelling the Myths PART 1 and PART 2.